1 : 5300000 Tallis, J. & F.
1 : 4118400 Letts, Son & Co.
169. Nuova Zelanda, Hawaii, Tasmania, Nuova Caledonia. New Zealand. Pergamon World Atlas. 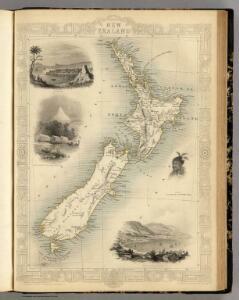 Map of the Colony of New Zealand. 1 : 2689632 Johnston, W. & A.K. Islands of the Pacific Ocean. Dominion of New Zealand. New Zealand (South Island). Auckland. Wellington. Dunedin. Partie, Nle. Zelande. Oceanique no. 60. River Thames, Mercury Bay, N.Z.